PS vs BRH, 48th Match, Big Bash League 2018-19. PS announced 13 men squad for the match with two changes. Josh Inglis and Clint Hinchliffe replace Michael Klinger and Nathan Coulter-Nile in the squad. BRH declared 13-men squad for the match. Sam Heazlett rejoins the squad replacing Mitchell Swepson. Mitch Marsh (c), Ashton Turner (vc), Cameron Bancroft, Jason Behrendorff, Hilton Cartwright, Liam Guthrie, Nick Hobson, Matt Kelly, Shaun Marsh, Usman Qadir, Andrew Tye, Josh Inglis, Clint Hinchliffe. Chris Lynn (c), Max Bryant, Ben Cutting, Brendan Doggett, Josh Lalor, Brendon McCullum, James Peirson (wk), Mujeeb Ur Rahman, Alex Ross, M Kuhnemann, Jack Prestwidge, Matt Renshaw, Sam Heazlett. Cameron Bancroft (wk), Shaun Marsh, Mitch Marsh (c), Ashton Turner, Hilton Cartwright, Nick Hobson, Clint Hinchliffe/Liam Guthrie, Andrew Tye, Jason Behrendorff, Matt Kelly, Usman Qadir. 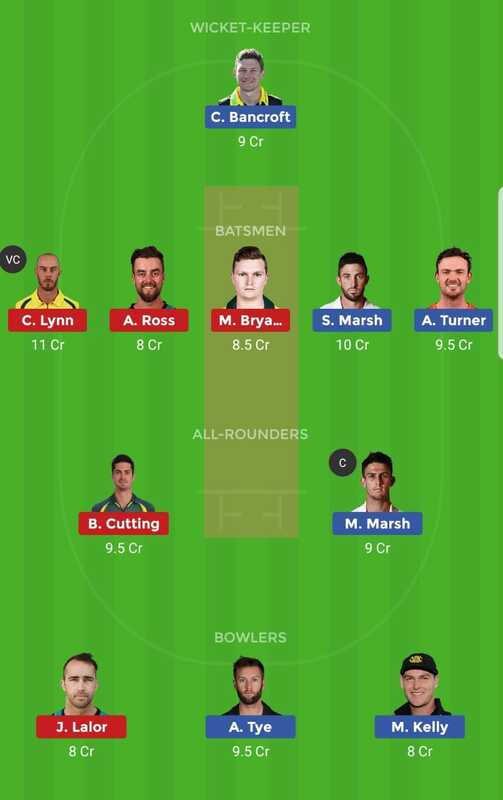 Max Bryant, Brendon McCullum, Chris Lynn (c), Matt Renshaw, Alex Ross, James Peirson (wk), Ben Cutting, B Doggett, Josh Lalor, Mujeeb Ur Rahman, Matthew Kuhnemann/J Prestwidge. 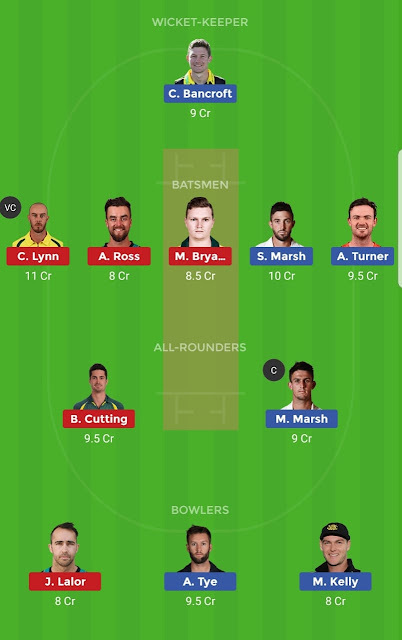 Other C & VC Options: S Marsh, B Cutting, A Tye, C Bancroft. 🎬Watch Video Team & make your own GL Team.